Did Herod Agrippa Die In The Theatre? Moscow Patriarchate: "Schism Is Outmoded"
The Battle of Kosovo: Defeat or Victory? The English poet Kipling began his poem with the words: "Oh, the West is West, and the East is East, and they will never move from their places, until heaven and earth appear at God's Last Judgement". Here by East and West we must not understand the parts of the world, which are divided geographically by the Ural and Caucasian Mountains. Rather, by East one must understand to be that extensive region, which was occupied by the eastern part of the Roman Empire, and then by Byzantium and the countries of the Near East (here it is possible to include both Egypt and Ethiopia), and by the West the Western European powers and generally all countries of West European culture. The Holy Fathers metaphorically said: "Light began to shine from the East"; the East symbolically represented Paradise, Eden, a country of eternal Divine Light. The West is young in a cultural-historical sense. The West is young. The East is old. The West is active. The East is contemplative. The West is all into emotions, all in motion, all very dynamic. However, the East is deep into itself; it appears that it does not want to remove its sight from the treasures which it possesses. The West is impulsive, is into searching, is into daring. The East keeps what it has. The West daydreams and fantasizes. The East searches everywhere for eternal ideas under what is visibly covered. The West dresses its saints in snowy garments, crowns their heads with wreaths of roses, but the East sees holiness equally both under rags and under gold. It sanctifies neither the rags of the poor, nor the monk's simple shirt, nor the rich dress of the tsars - it's as though it does not see the external. The West sends regiments of crusaders to liberate Christ's Tomb. The East sends monks into the deserts of Egypt and dwellings of Mt. Athos. The West bares the sword against the enemies of the faith. The East provides spiritual warriors for the invisible fight with the demons. The West, in order to suppress evil, creates such institutions as the Inquisition, and the East – great philosophical systems. The peak of western theology – is Blessed Augustine, a brilliant poet and thinker; but he is thoroughly psychology oriented. Eastern theologians: Saints Gregory the Theologian, Basil the Great, Gregory of Nyssa – are mystical. Augustine, his school brilliantly showed man in his fall and agony of searching, and the Eastern theologians showed man in his transfiguration. The West, by the mouths of its saints, sang a majestic hymn to God; the East, in a mystical silence, contemplated about God. The West was reaching out to the azure skies, and the East searched so as to meet God in the depths of the heart. Western ascetics tried to imitate Christ outwardly; the Eastern ones considered that there is only one way to imitate Christ – by acquiring the grace of the Holy Spirit: man, having acquired the Holy Spirit, only by grace, invisibly, becomes comparable to Christ. Western ascetics with songs on their lips went to Golgotha; the Easterners made life itself a Golgotha, invisible to the world. Some of the western ascetics imagined Christ so vividly, that they identified themselves with Him; on their hands and soles of their feet wounds appeared, from which ran blood. 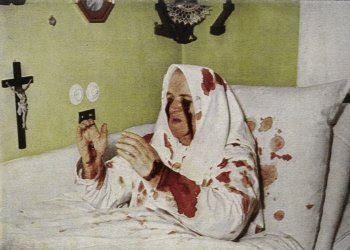 Stigmata was revered by Catholics as a sign of holiness. But the holy ascetics of the East tried to see only one thing – the sea of their sins and considered a terrible pride to compare oneself with Christ. The West resembled the young soldier, who bared his sword, the East – the old man, whitened with the gray hair of wisdom. The West wanted to bring the Kingdom of Heaven down to earth, to build a paradise on earth by earthly means. The East always paid tribute – to Caesar what is Caesar's – and prepared the way to the Kingdom of Heaven in man's heart, the passage not into the earthly Kingdom, but the eternal one. For the West the battle with evil was the earth, this temporary life with all its events and troubles, while for the East it was the human heart, which it saw as being deeper than the entire visible world. The West is active, but all its activity is turned externally. The East turned the dynamics of the spirit into itself. Western civilization is like a wide wave of light, but scattered light, light that is refracted through earthly prisms of different colors. But the East is the concentration of light at one point, and this is why this light has the special quality (energy, strength) to be converted into a flame. The West loved the earth, and in heaven he saw the earthly (earth). The East loved heaven and in the earthly (earth) he saw the symbols of heaven; in the temporary he searched for the signs of the eternal. Already the third bishop of Rome – Saint Clement, the successor of the holy apostle Peter, compared the Church with the army and called Christians to strict discipline, so that this army would be victorious. But in the East the Fathers said: "Conquer yourself – this is the highest of all victories". The ascetic teaching of the Eastern Fathers is a strategy of this spiritual fight (struggle) – fight with demons, with one's own passions. For the army to be victorious it is necessary to have centralized control, a strong authority is required and unconditional subordination, this is why the West created the Church structure, similar to a monarchy. For the fight with the age-old enemy of humanity the East searched for another force – this is the force of humility, in which the true power of the spirit is manifested. The West is oriented to external might: by external means it created various organizations, affected influence on culture, everywhere it looked for allies – in the world of arts, in literature, in politics, in society. But the East said: "True good can be created only with God's grace" and therefore it always rejected questionable allies; outwardly it seemed poorer, more helpless, weaker than the West; however, it did not look for power nor might of the world, but it searched for Christ, Who conquered this world. The asceticism of the West fills the souls of ascetics with enthusiasm and with admiration, the asceticism of the East – with repentance. The West, in the beauty of the world, desires to contemplate God's beauty. For the East God is Unutterable, Unknowable and Inexpressible. God, for the East, is not like anybody or anything from His creation – He is an eternal secret. The Western ascetic wants to embrace God, and the Eastern pleads only for one thing – the forgiveness of sins; searching in prayer for any kind of exalted states – this for him is already a sinful effort. The Western ascetic sees the light, which descends upon him from the outside (this is the vision of Francis of Assisi and others), and the Eastern sees Light, which lights up his heart from the inside; and as such he quivers, before God's favor, as unworthy of it. Western ascetics, demonstrating repentance, walked in cities in groups, entire societies, which were called "repentants" (or "penitents"); on streets and squares they removed their clothing and, in the presence of enormous multitude of people, would strike (flog) themselves with ropes and belts until they bled, and the ecstatic crowd glorified them as great saints of God, heroes of the faith. The Eastern – in the silence of the deserts offered repentance, invisible to the world; once one of the great Egyptian Fathers loudly sighed in church during prayers, but immediately he caught himself and, after turning himself to the nearby monks, said: "Forgive me, brothers, I am not yet a monk" – because repentance, as all virtues, must be secret. For the West the main thing is works (deeds). The works, for him, are of value: just as the good deed and so also the sin have a specific, clear structure (form) and a value. For the East the main thing is the spiritual state, and works are only its manifestation. Therefore, for the East even a small deed can be great, if it proceeds from a pure heart, and a great podvig (spiritual exploit or struggle) is negligible, if it is not dedicated to God or done by unworthy means. The morals of western ascetics are based on "the principle of quantity": who, outwardly, made more good deeds; the morals of the East are based on the purity of the heart, known only to the One God. The West attempted to realize the idea of God's Kingdom on earth, but with the methods of government: incentives, sanctions, intrigues and the like, transferred into the Church, profaned the purpose itself. "The end justifies the means" – this unwritten Jesuit motto with the greatest clarity and assuredness expressed the mood of those who are truly ready to build an "earthly paradise" by any means, at any price. However, the Eastern Church taught: a pure purpose, pure methods, a pure subject, this is how it was formulated by St. Dionysius. The West says: "Love and do deeds of self-sacrifice" and the East, first of all, cleanses the heart with the fear of God in the struggle with the passions, for the acquisition of the grace of the Holy Spirit. 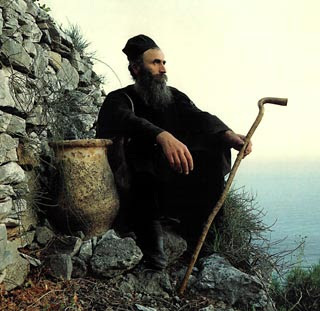 In the East there is only one monastic rule, one idea: the monk renounces the world and becomes a person who prays for it; the monk is like a star that rose from the earth to the heavens – he is far from everybody and shines for all. Western monks serve people and society. During many years, Hospitalers* took care of travelers and the monks of the order of Francis, "Franciscans", and educated children. The Jesuits were involved in politics, instruction of youth and similar works. Once, Catholic monks were asked whether they read ascetic literature. They were surprised and answered that such books were used only by professors and the teachers of history, and that their duty is to obey the father superior. The studying of the Jesus Prayer and of spiritual contemplation, in the West, are almost non-existent. Culture, science, society itself are constantly undergoing a change; that is why the face of Western Christianity is constantly changing: there rules the principle of modernism, there the ecclesiological teaching about evolution is accepted, new dogmas are born and new revelations are expected. * A member of a religious order known as the Knights of St. John of Jerusalem, that originated in the early 11th century in a hospital built in Jerusalem to care for the crusaders and pilgrims.